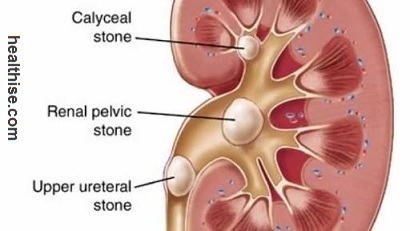 A kidney stone, also known as a renal calculus or nephrolith, is a solid piece of material which is formed in the kidneys from minerals in urine. 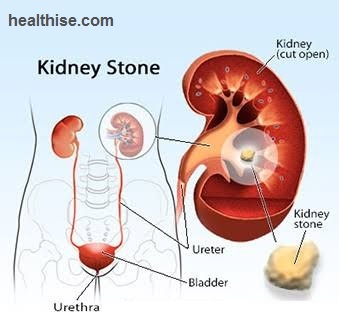 Kidney stones typically leave the body in the urine stream, and a small stone may pass without causing symptoms. 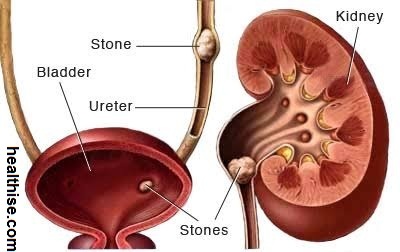 If stones grow to sufficient size (usually at least 3 millimeters (0.12 in)) they can cause blockage of the ureter. This leads to pain, most commonly beginning in the flank or lower back and often radiating to the groin. This pain is often known as renal colic and typically comes in waves lasting 20 to 60 minutes. Other associated symptoms include: nausea, vomiting, fever, blood in the urine, pus in the urine, and painful urination. Blockage of the ureter can cause decreased kidney function and dilation of the kidney. Commonly it is explained as formation of solid masses of mineral salt deposits. These mineral salts are generally filtered through the kidney and emptied via urine. There is a natural substance in urine that dissolves these minerals. This prevents them from becoming solids or calculi. But at times, because of dehydration, these salts don’t get dissolved and solidify. Their growth becomes large enough to obstruct the renal ducts. Sometimes, they even get stuck in the uterus causing a severe pain in the urinary tract. 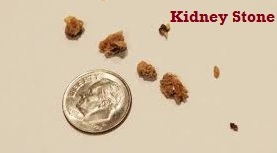 If left untreated, kidney stones can even lead to renal failure. Read on to explore more kidney stones information, its causes and symptoms.